Emberwing: Lost Legacy is rated 4.0 out of 5 by 28. Rated 5 out of 5 by jac5287 from Perfect amount of challenging I don't normally write reviews, but this game was really fun. The kind of adventure I like, and the right amount of challenging where it wasn't TOO hard but I had to really think. There was a weird glitch where I could keep going back to get the bear helmet as many times and it would keep going into my inventory, but it didn't affect anything else. If anyone knows of any more games like this, please recommend to me! Rated 5 out of 5 by bwake47 from DEFINITELY RECOMMEND THIS GAME !! Sparkleglow100 wrote: "IF you wish you could live in the Elven kingdom and/or are a Lord of the Rings movie fan, (but don’t care much for the battling), then you will LOVE this. This is mainly an adventure type game. It does have some very straightforward puzzles, but only a few HOGS (I didn't count but it was something like 3 or 4). SETTINGS, ART and GRAPHICS: Fantasy, forest, waterfalls, moonlit landscapes, abundant sparkling stars, and therefore lots of enchanted nightglow and shimmering going on. You follow pathways through crumbling ruins and beautiful landscapes. Talented artist(s) have created stunning settings with gorgeous perspectives. STORY: Unfolds like a storybook. I found it thoroughly enjoyable up until the last 1/5 at which point it lost momentum and then I was ready for it be wrapped up. The characters in this game are dignified in both the manner in which they interact with you and also their manner of dress. Nothing inappropriate, gory or scary (not in the SE anyway). Anyone can play this game. What is an Emberwing? You’ll find out." _______________________________________________ I agree completely, pretty much describes this game. I loved playing with all the different characters. The scenery was beautiful to look at, and the music went along well with the scenery. I enjoyed the story and really got into what was happening. If you get stuck, you hit the hint button and it will show you where you need to go, plus take you there. Between the very useful map and hint button, I didn't feel completely lost at any time (which is a nice change). I definitely recommend trying this game. It isn't the usual fairytale storyline and characters. Rated 5 out of 5 by SparkleGlow100 from FANTASTIC FANTASY! IF you wish you could live in the Elven kingdom and/or are a Lord of the Rings movie fan, (but don’t care much for the battling), then you will LOVE this. This is mainly an adventure type game. It does have some very straightforward puzzles, but only a few HOGS (I didn't count but it was something like 3 or 4). 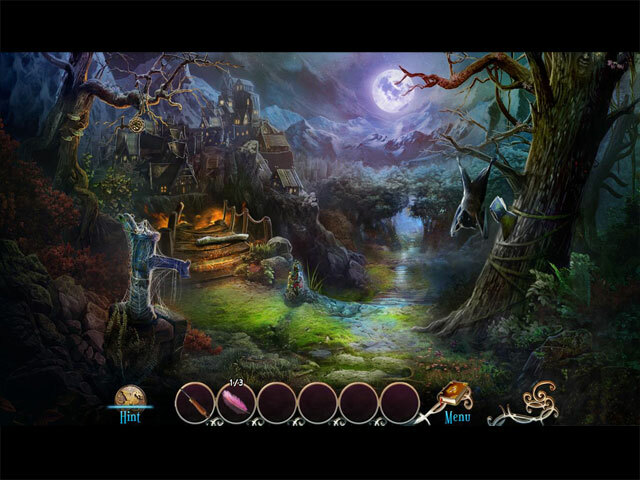 SETTINGS, ART and GRAPHICS: Fantasy, forest, waterfalls, moonlit landscapes, abundant sparkling stars, and therefore lots of enchanted nightglow and shimmering going on. You follow pathways through crumbling ruins and beautiful landscapes. Talented artist(s) have created stunning settings with gorgeous perspectives. STORY: Unfolds like a storybook. I found it thoroughly enjoyable up until the last 1/5 at which point it lost momentum and then I was ready for it be wrapped up. The characters in this game are dignified in both the manner in which they interact with you and also their manner of dress. Nothing inappropriate, gory or scary (not in the SE anyway). Anyone can play this game. 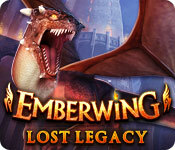 What is an Emberwing? You’ll find out. MUSIC: Orchestral and atmospheric. HINT: Will tell you what needs attending to, but NOT what item to use. For the SE, BFG does a walkthrough. Google it and it’ll come up immediately. Sometimes they have them in “community” at the top of the web page. TASKBAR: Stays visible at all times. 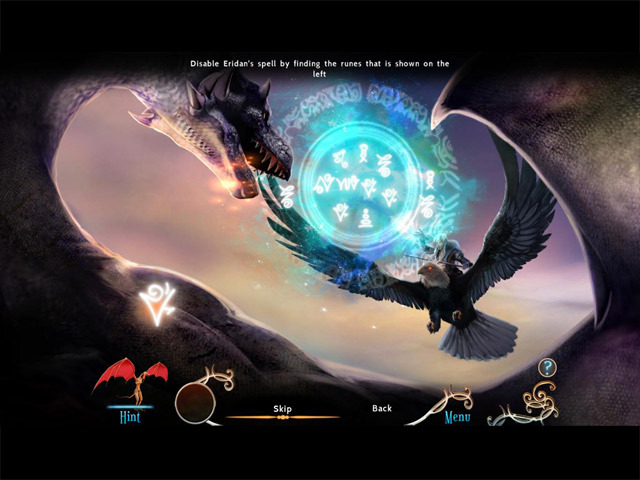 LEVELS OF DIFFICULTY: 3 levels of difficulty which are changeable during gameplay. CONS: *** I read a lot of reviews talking about difficulty in using items. I did find this a few times, not always, and sometimes I had to try maybe 6-7 times. The trouble with that was that I didn’t know if I was using the right item or not anyway! ***Also a slightly unpleasant sound when you click on stuff, so I had to have the ambient sounds lower in volume than I would have liked, since they were tied-in. ***Lastly of course, the loss of momentum during the last 1/5 that I mentioned earlier. Even so, this is the first game that I complete as an SE, that I then go on to buy again as a CE on one of those sales! Rated 5 out of 5 by tutortime from Excellent Game ! A very long game with an interesting story line. The graphics were good and colors a bit dark due to the theme. Rated 5 out of 5 by grammakk from love dragons read the reviews after i bought and played the game. i was so surprised to see some low ratings i thought this game was awesome. not a lot of hos but had a story to it and kept you wondering what was going to happen next. i wasn't going to review this game..been a bit behind lately. but felt i had to to defend it..loved it. Rated 5 out of 5 by rosekaufmann from ANOTHER WINNER Locations were beautiful. Interesting story as you try to save your son from the dark forest after he was abducted by a dragon and it has its twists and turns. Good proportion of HOS to mini-games, both of which were nicely done. Mini-games were moderately challenging but you could figure them out with enough thought. Good production values and thoughtful, well-written story. Rated 5 out of 5 by Yanie1020 from Another Winner! Really liked this one! Excellent graphics, good voice overs (why are the children always the best actors? ), fun puzzles, not an overabundance of HOS's (which is fine with me), and the music, which wasn't especially memorable, also wasn't annoying. Had to use the hint button twice while playing in the most difficult mode, so the challenge was just right. Map was very good, and so were the hints. Rated 5 out of 5 by rondakbandy from Pure fantasy. This game was so much fun! There were dragons, Elves, Trolls and many other creatures. There are two levels of difficulty. I play casual so if you want increased difficulty you can have it. There is a really good map that indicates action needed and you can teleport with it. 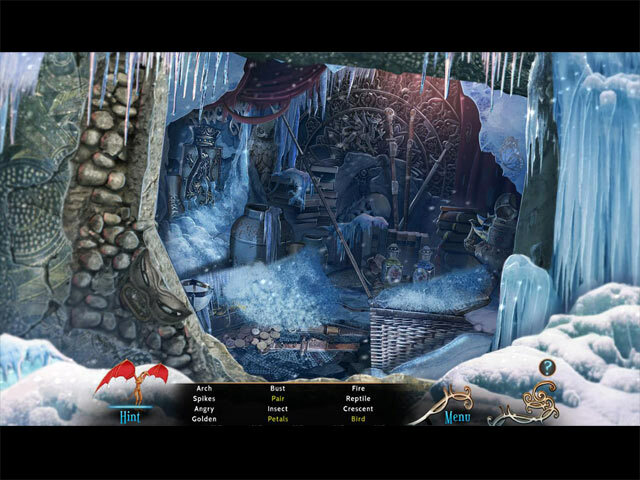 This game is graphically stunning, and the hidden objects are very easy to see once found. There are no sparkles but I am not the brightest bulb but was able to finish without a walkthrough. The only downside was in using some items, you have to click it in very specific spots. Those are annoying but just keep trying. Excellent!